Everything from alternators and auger fingers to wheels and work lights can be found in John Deere’s first ever printed parts, service, equipment and supplies catalogue, mailed free by participating dealers. 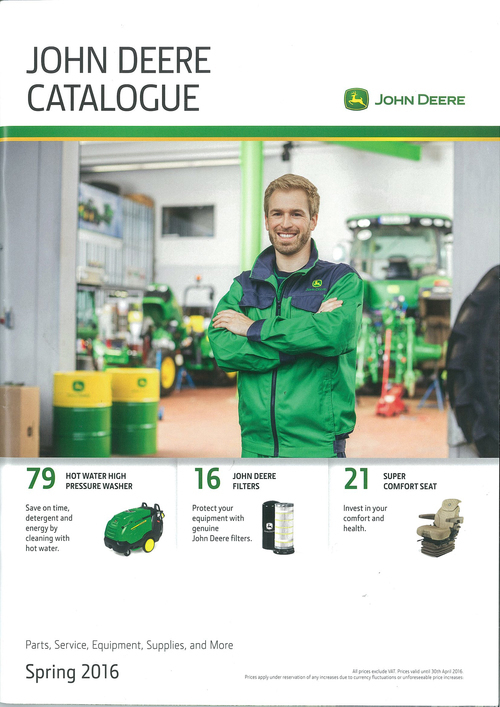 Just published for spring 2016, the 96-page catalogue features around 1000 items covering the full range of John Deere agricultural parts, attachments and accessories, grouped by product. These include fast-moving and wearing parts for tractors and engines, combines, self-propelled foragers, sprayers, drills, balers and Gator utility vehicles, as well as FarmSight precision farming kits. Other items include batteries, paints, chemicals, lubricants, camera systems, radios and other accessories for the farm workshop. The new 2016 parts catalogue complements the established JDParts website at www.jdparts.deere.com, which allows customers to register online with their local dealer, identify the parts required and check stock availability before ordering.